Thousands of Russians have protested across the country against government plans to raise the pension age. 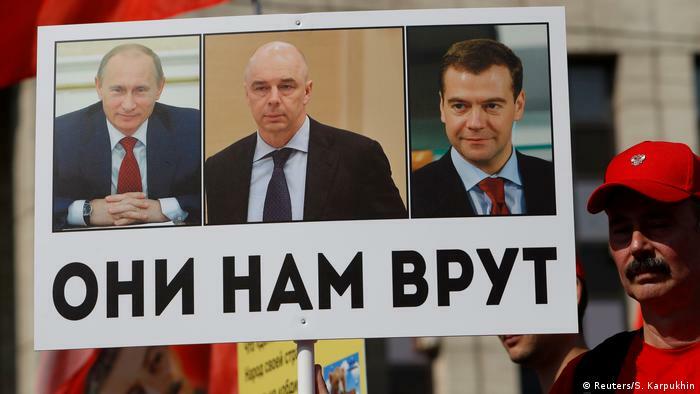 The rallies come despite concessions made by President Vladimir Putin earlier this week. Large protests took place throughout Russia on Sunday as thousands protested again against government reforms to state pensions. Moscow was the site of one major rally that drew several thousand people following a call from the Communist Party. Other protests were reported in Vladivostok in the Far East of the country, and in the Siberian cities of Barnaul and Novosibirsk. White Counter, an NGO that tallies attendance at demonstrations, said some 9,000 people took part in the Moscow rally, but police put the figure at around 6,000. The size of the rallies indicates the unpopularity of the proposed measures, which were opposed by 90 percent of Russians when they were introduced on June 14, opinion polls showed. Approval ratings for President Vladimir Putin have also fallen around 10 percentage points since the pension reforms were proposed, according to polls by the Levada Centre. Not living to see retirement? The demonstrations took place despite Putin's efforts on Wednesday to argue the case for the reforms and to water down the proposals. In a televised speech, the Russian president described the reforms as a financial necessity but promised to raise the pension age for women, currently 55, to 60 rather than the originally proposed 63. He said that the proposal to raise the pension age for men to 65 from the current 60 would go ahead. Some critics see the later pension age for men as especially problematic in view of the fact that the life expectancy of men in Russia in 2018 was just 66.4 as compared with 77.2 for women. This could mean that many men never live to their retirement age. Others point out, however, that this figure is likely to go up as nutrition and health care in the country improve and alcohol and tobacco consumption decline.